President Viktor Yushchenko's condemnation of the Ukrainian parliament's decision to sack his government has led to an acute stand-off between the two. BBC regional affairs analyst Steven Eke examines whether the conflict goes beyond anger over the recent vote of no-confidence. Ukraine is mired in a deep political crisis. The cause, according to one camp, consisting of a large number of deputies, is the raft of shortcomings, as they see them, in the gas deal signed with Moscow. According to the other camp - President Yushchenko and his associates in the government - it is about power games and an attempt to undermine him and his allies ahead of the election. This election is significant because constitutional changes introduced on 1 January shifted important powers from the president to parliament. They include the right to name the prime minister and form a government. Prime Minister Yuri Yekhanurov accused parliamentarians of being unable to grasp the complexities of energy supplies to Ukraine, and of undermining the country's political and economic interests. In particular, there is concern over whether the political crisis will prevent the sealing of the gas deal with an appropriate intergovernmental agreement. The existing government is still to submit a draft to its Russian counterpart, and there are fears that any new government would be under tremendous pressure to reject the deal entirely. The "dream ticket" alliance of Viktor Yushchenko and Yulia Tymoshenko seems resolutely dead. Following her sacking last year, over what was widely acknowledged as very poor management of the economy, Ms Tymoshenko has allied herself, varyingly, with forces opposed to her erstwhile Orange Revolution ally. Some Ukrainian analysts say she is positioning herself in a bid to regain her premiership. Ms Tymoshenko herself said earlier this week that there was no question of her forming an alliance with Mr Yushchenko's enemies. She insisted that, in actually backing them over specific issues like the gas contract, she was acting according to conscience and what she perceived as Ukraine's national interests. Ms Tymoshenko remains popular with many members of the "orange electorate", but some say she has now over-played her hand. The motion dismissing the government was strongly backed, after all, by "Regions of Ukraine", led by Viktor Yanukovych, the Russian-backed opponent of Viktor Yushchenko in the 2004 presidential election. To many Ukrainians, it looked like political pay-back time. It also drew support from the Communist Party, Social Democratic Party, and two groups supporting parliamentary speaker Volodymyr Lytvyn - a highly influential political figure in his own right. The situation is made even more complicated by the absence of a functioning Constitutional Court. It has been unable to convene because parliament has not scheduled a swearing-in session for new judges. Parliament breaks for a three-week winter recess on Friday, and it is unclear just what rights Yuri Yekhanurov, the now care-taker prime minister, retains until the election. But already, many analysts say that the political scene after the election may be no less restive. 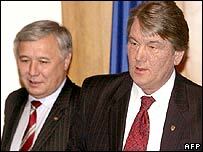 Parliament, boosted with new powers, could enter a period of protracted political struggle with Mr Yushchenko. It may also shape a quite different strategic course than the pro-western programme of integration with the EU and Nato espoused by the president. The political situation inside Ukraine is causing concern abroad. While Russia may welcome the possibility of a larger pro-Russian group inside Ukraine's parliament, both the European Union and US State Department have voiced concerns over Ukraine's reform programme. They have called on all sides to act within the law to preserve stability in the run-up to the election campaign. What effect will deal have?